Native plant advocates originally thought they would be able to destroy all non-native trees in California based entirely on their preference for native plants. People who value our urban forest quickly challenged that assumption. Native plant advocates devised a new strategy based on fear. Fear is the most powerful justification for many public policies that deliver a wide range of agendas, including the current prejudices against immigrants that is shared by many native plant advocates. 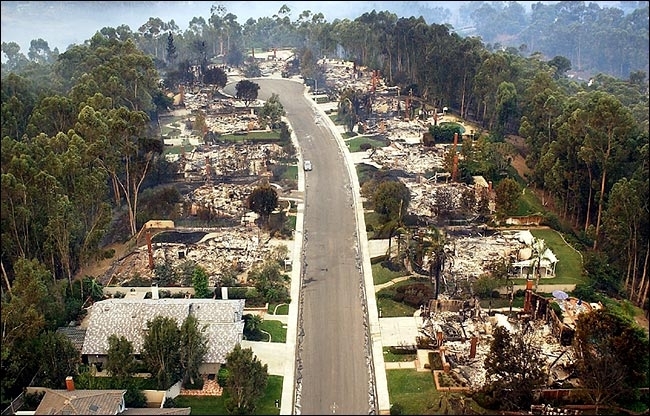 After the destructive wildfire in Oakland in 1991, native plant advocates seized on fear of fire to convince the public that all non-native trees must be destroyed. They made the ridiculous claim that native plants and trees are less flammable than non-native plants and trees. Like most lies, the wildfire cover story has come back to bite the nativists. As wildfires rage all over the west, becoming more frequent and more intense, the public can see with their own eyes that every fire occurs in native vegetation, predominantly in grass and brush and sometimes spreading to native forests of conifers and oak woodlands. It has become difficult for nativists to convince the public that native vegetation isn’t flammable because the reality of wildfires clearly proves otherwise. Recently, nativists have become the victims of their own wildfire cover story as they try to reconcile the contradictions in their hypocritical agendas. These contradictions are now visible both nationally and locally in the San Francisco Bay Area. We will tell you about the lie that binds nativism today. The New York Times published an op-ed by Michael Brune, Executive Director of the Sierra Club, and Chad Hansen, ecologist and member of the Sierra Club Board of Directors. They informed us of a proposed federal farm bill to destroy trees on thousands of acres of national forests without any environmental review. The stated purpose of this federal plan is to reduce wildfire hazards. They point out that climate change and associated drought have increased the intensity of wildfires. Therefore, they say we must “significantly increase forest protection, since forests are a significant natural mechanism for absorbing and storing carbon dioxide.” Destroying forests contributes to climate change and climate change is causing more wildfires. Does that strategy sound familiar? Perhaps you read that exact strategy here on Million Trees or on many other local blogs that share our view that destroying trees is not the solution to fire hazard mitigation and safety. Unfortunately, the Sierra Club continues to talk out of both sides of its mouth. While the national leadership speaks rationally on the subject of wildfires, the local leadership of the San Francisco Bay Chapter of the Sierra Club continues to demand that all non-native trees in the Bay Area be destroyed. 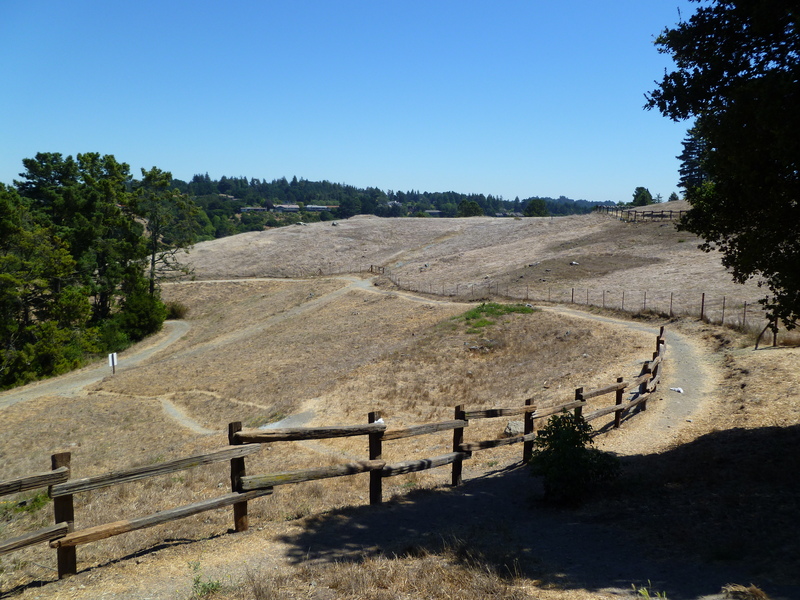 The local chapter of the Sierra Club is making the same demands for complete eradication of non-native trees in the East Bay Regional Park District. The pending renewal of the parcel tax that has paid for tree removals in the Park District for the past 12 years was an opportunity for the Sierra Club to make its endorsement of the renewal contingent upon the Park District making a commitment to remove all non-native trees (and many other commitments). The Sierra Club has endorsed the renewal of the parcel tax—Measure FF—that will be on the ballot in November 2018. In other words, the Park District has made a commitment to removing all non-native trees on our parks. 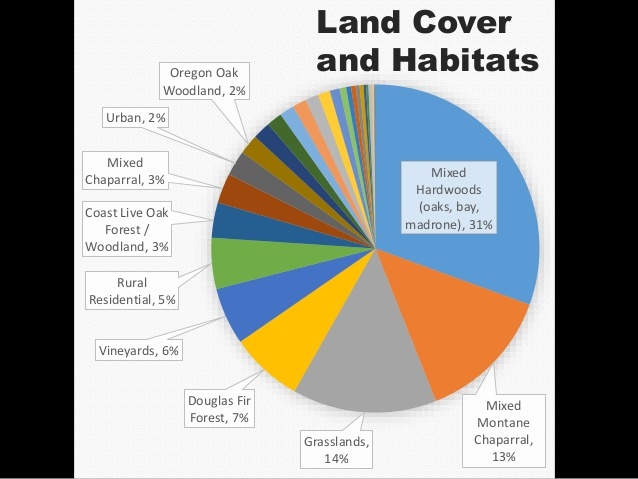 We have reported on some of the clear cuts that the Park District has done in the past 6 months. The national Sierra Club and the San Francisco Bay Chapter of the Sierra Club are at odds on fire hazard mitigation. The national leadership understands that destroying trees will not reduce fire hazards. They also understand that destroying trees will contribute to climate change that is causing more destructive wildfires. The local leadership clings to the cover story that native trees are less flammable than non-native trees. There is no history of wildfires in San Francisco and there is unlikely to be in the future because it is foggy and soggy during the dry summer months when wildfires occur. But the reality of the climate conditions and the absence of fire in the historical record never prevented nativists in San Francisco from trying to use the fire cover story to support their demand that thousands of non-native trees be destroyed. 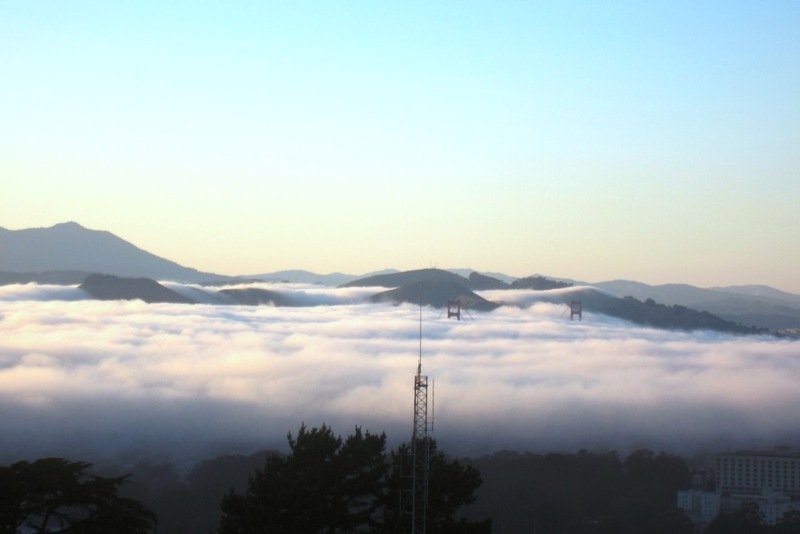 Summer fog blanket over San Francisco. Courtesy Save Mount Sutro Forest. Jake Sigg, retired San Francisco Recreation and Parks Department (SFRPD) gardener who is considered the doyen of the Native Plant movement in San Francisco, has a widely circulated email newsletter. In that newsletter, he repeatedly claimed that eucalyptus were dying during the extreme drought and had to be destroyed so they would not cause a catastrophic wildfire. In fact, eucalyptus did not die in San Francisco or elsewhere in the Bay Area during the drought because they are the most drought-tolerant tree species in our urban forest. More native trees died in California during the drought than non-native trees. Jake Sigg made those dire predictions before the native plant agenda was finally approved in 2017 after 20 years of heated debate and before many wildfires in California have established the truth that wildfires start in grass and brush and seldom in forests and in every case in exclusively native vegetation. So, to accommodate this new reality, Jake Sigg has changed his tune. He got his wish that thousands of non-native trees be destroyed in San Francisco as well as a commitment to restore the native grassland that he prefers. Consequently it is no longer consistent with that agenda to claim that there are acute fire hazards in San Francisco, requiring the destruction of flammable vegetation. According to nativists, the wet eucalyptus forest must be destroyed, but the dead/dried flammable brush and grassland must be preserved because it is native. Despite the constantly shifting story, we are not fooled. The truth is that native vegetation is just as flammable as non-native vegetation and that destroying trees—regardless of their nativity—will not reduce fire hazards. (1) These letters on Sierra Club letterhead were obtained by public records requests and are available on request. Thank you SO much for this brilliant, necessary post. It is heart-breaking to see the damage at Sibleys by the EBRPD. I live in Oakland, but can’t bear going to our local parks because so often beloved trees are gone, and the poison spraying is so visible. So instead, I went to hike around Lake Lagunitas on Mt. 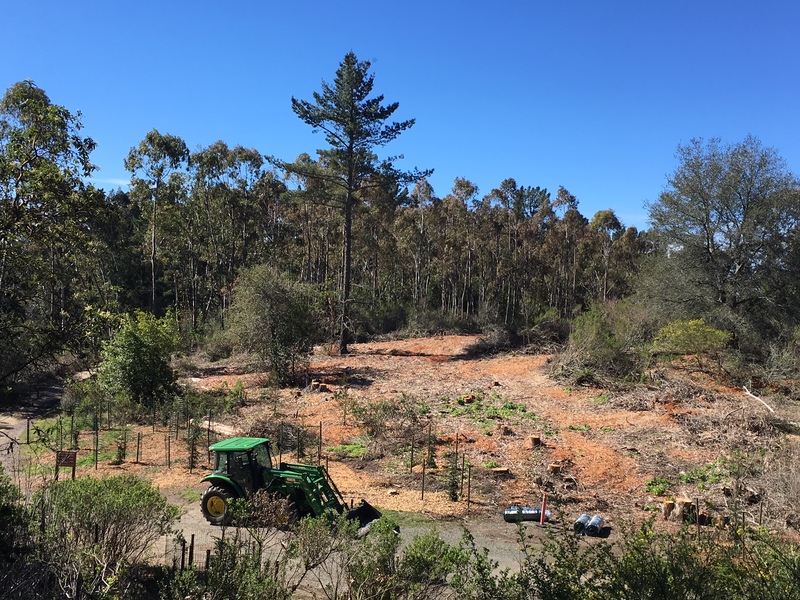 Tamalpais in the Marin Municipal Water District last week and was horrified to see that even there, workers are killing trees with heavy machinery, making the hottest, driest section of the trail become even hotter and drier. The reason, they were told by a state agency: “To reduce the fuel load to prevent fire.” They are increasing fire risk. How do we stop these maniacs? That’s why your work is so important.